Distant view of Sikander Lodi's Tomb, Delhi. bl.uk > Online Gallery Home	> Online exhibitions	> Asia, Pacific and Africa Collections	> Distant view of Sikander Lodi's Tomb, Delhi. 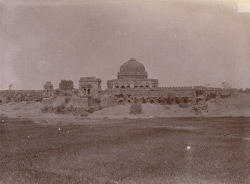 Photograph of the Sikandar Lodi's tomb, Delhi from the Archaeological Survey of India Collections, taken in the 1880s and attributed to Henry Hardy Cole (the attribution is probably incorrect). The Lodi sultans were an Afghan dynasty who ruled over Delhi between 1451 and 1526 after the fall of the Sayyids. Tombs are the most significant monuments of both the Lodi and Sayyid periods and many were built in a necropolis now known as the Lodi Gardens, including that of Sikander Lodi (r.1489-1517). The tomb of Sikander Lodi, built1517-18, unlike other tombs of the Lodi period based upon a square plan, was a revival of the earlier Sayyid type, with an octagonal plan, deep verandah, and tall arches. The western wall was a wall-mosque and the tomb is topped with a double dome. The tomb is surrounded by a square garden enclosed within high walls.